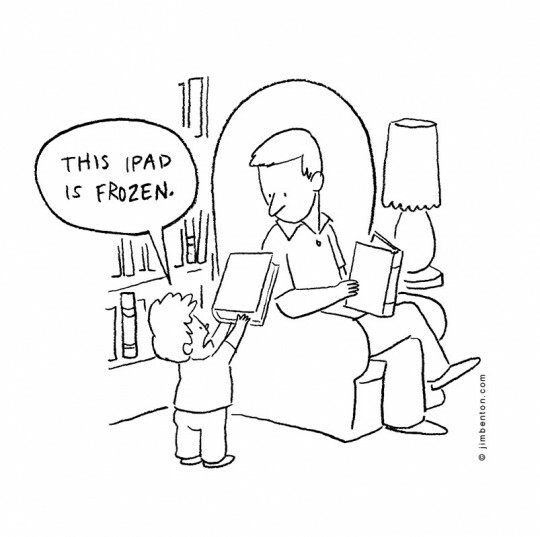 A list of the funniest comic strips and cartoons about ebooks, e-readers, and reading in digital times. 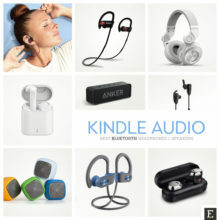 Electronic books, audiobooks, e-readers, or book reading apps, become a mainstream topic. More and more people start reading ebooks on their tablets and smartphones. A transition from paper to screen is usually not easy. Although being with us for more than 40 years, ebooks are still perceived by many users as too complicated, and lacking essential benefits of print books. Common problems and fears are a great source of ideas for cartoonists. The major source of fun is powered by a natural human need to embrace the uncertainty. What ebooks can’t do is still the biggest reason to laugh. But there are more and more cartoons that try to predict the future. 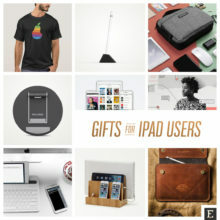 The fun is focused on showing bookless shelves or comparing technology to paper. Here is an updated selection of the funniest cartoons we’ve come across the web. 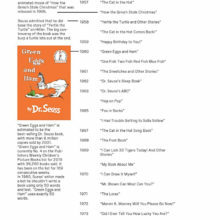 We’ve also included the most popular ebook cartoons created by ourselves. Please, let us know if you find any cartoon that should be included in this list. Thanks! 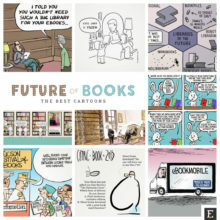 The bright future of books and libraries in cartoons by Tom Gauld, Grant Snider, John Atkinson, Jeff Koterba, Jim Benton, and Piotr Kowalczyk. 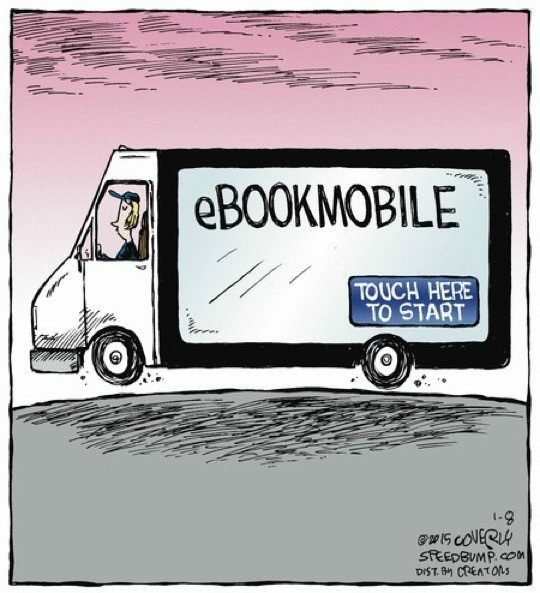 E-bookmobile – just touch to start. A cartoon by Dave Coverly. ⇢ Credits and more info. 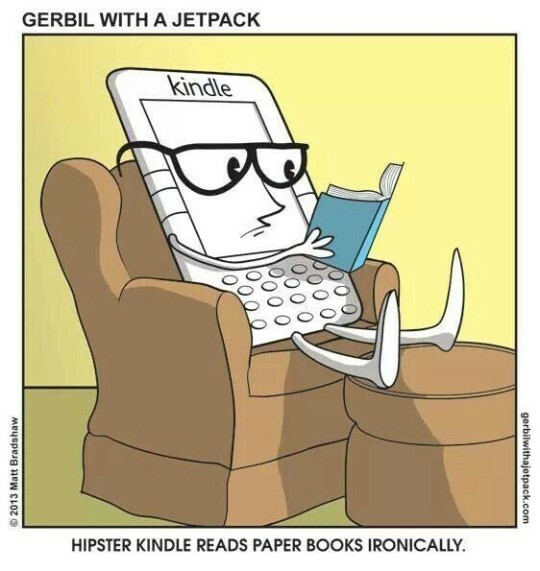 Hipster Kindle… “reads paper books ironically.” A cartoon by Matt Bradshaw / Gerbil with a Jetpack. ⇢ Credits and more info. 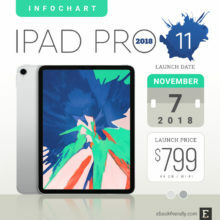 iPads in the classroom. What happens when you ask kids to do their homework on tablets. ⇢ Credits and more info. Available book formats. The final novel in a series is available in the following formats. A cartoon by Tom Gauld. ⇢ Credits and more info. Frozen iPad. This is what will happen if you won’t encourage your kid to read. ⇢ Credits and more info. Don’t use a tablet for this. 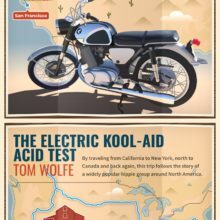 There is one area where paper magazines will always beat their digital editions. ⇢ Credits and more info. No more dead tree paper. Mimi and Eunice test the Kindle in the toilet. ⇢ Credits and more info. 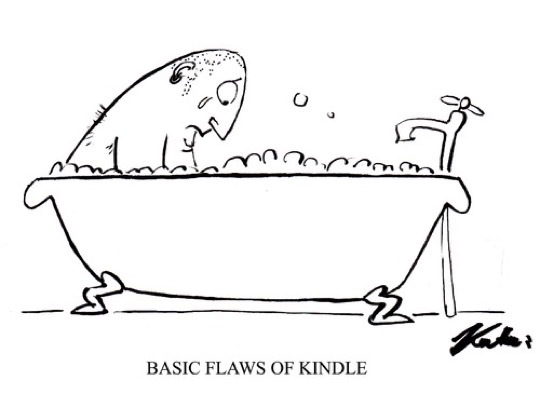 Basic flaws of the Kindle. 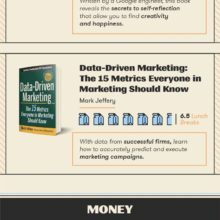 Many book lovers read in a bathtub. Consider giving your Kindle a waterproof jacket. ⇢ Credits and more info. 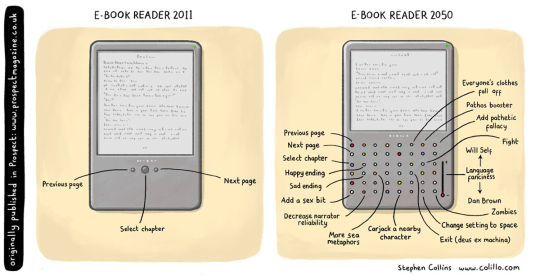 E-reader drawbacks. 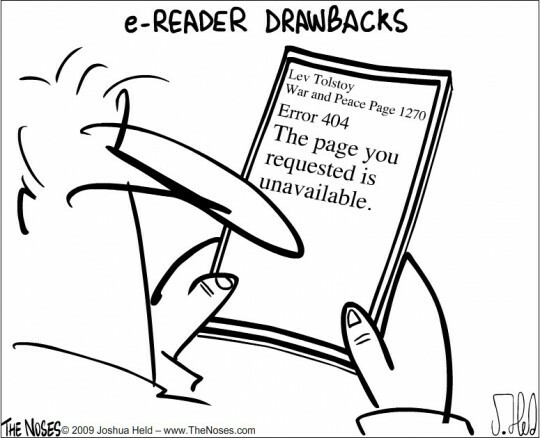 Problems users have with their new e-reading devices are the endless inspiration for cartoonists. Joshua Held (The Noses) covers error 404. ⇢ Credits and more info. 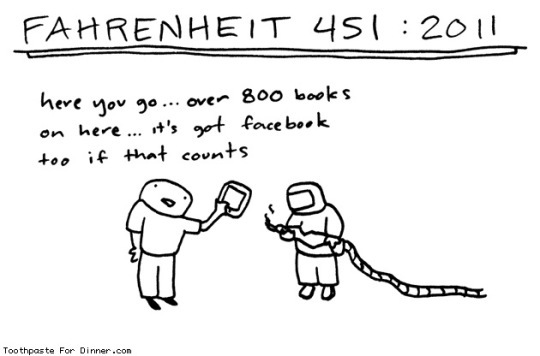 Fahrenheit 451, digital edition. Ebooks bring a plenty of new circumstances to book burning. A cartoon by Toothpaste for Dinner. ⇢ Credits and more info. Book burning, Kindle version. A cartoon by xkcd. ⇢ Credits and more info. It’s a book, use your imagination. 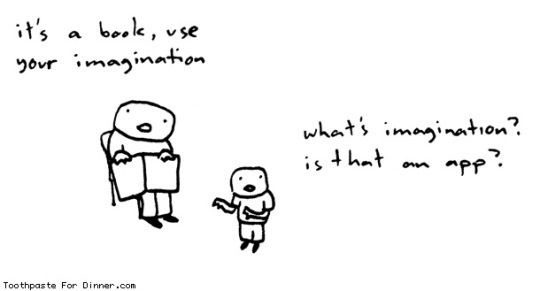 Toothpaste for Dinner’s take on using imagination in reading. ⇢ Credits and more info. The book of the future. 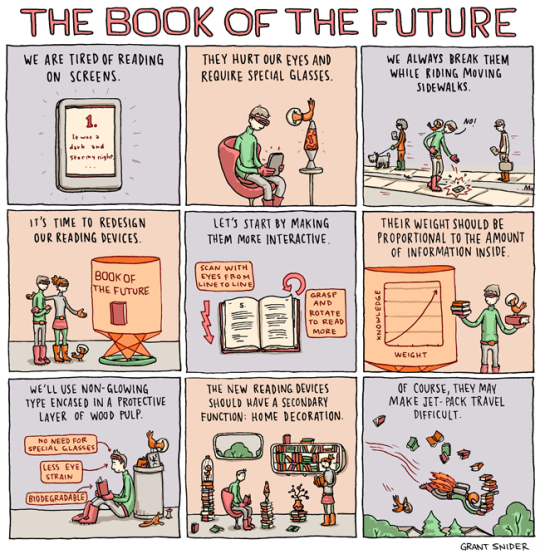 Grant Snider from Incidental Comics imagines the future of the book. ⇢ Credits and more info. Like a book. This new e-reader thingy is so clear it’s like looking at a book. A cartoon by Tony Cole. ⇢ Credits and more info. 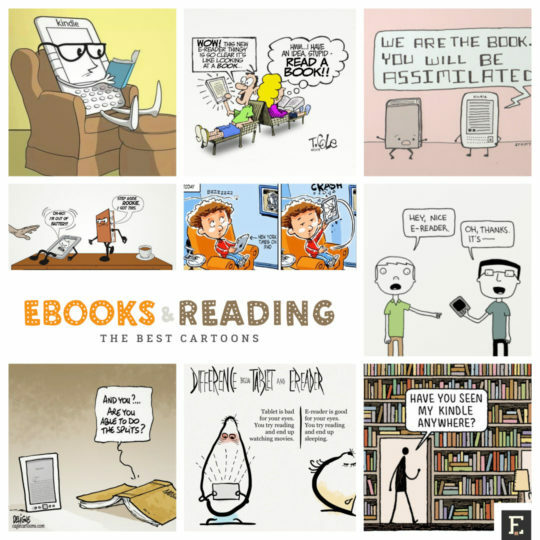 Ebook readers in 2050. 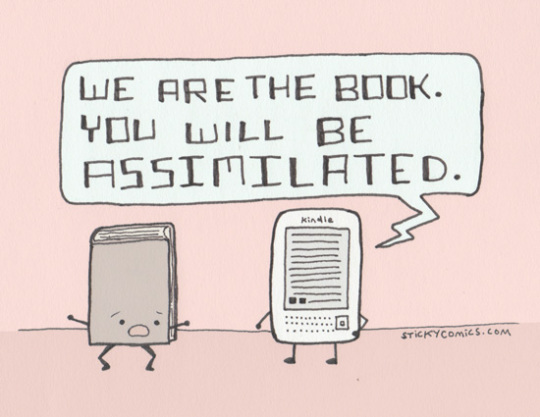 Stephen Collins’ hilarious “predictions” about how e-readers will look like in the future. ⇢ Credits and more info. Gifting a book in 2033. The biggest problem with ebooks is that it’s hard to gift them. 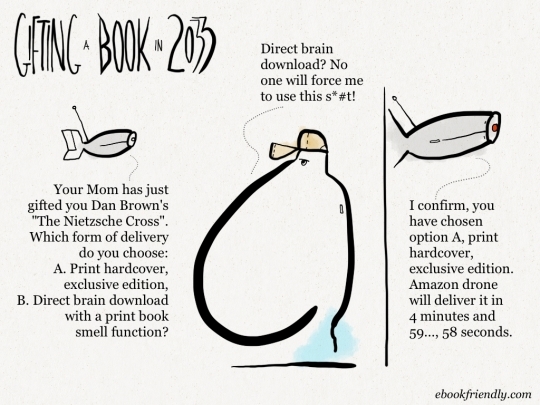 But what about gifting print books in the future? ⇢ Credits and more info. New on your e-reader: used book simulation. How to make an e-reader a more friendly medium. 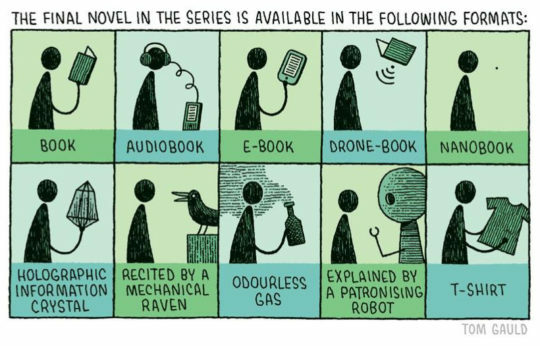 A cartoon by Tom Gauld. ⇢ Credits and more info. 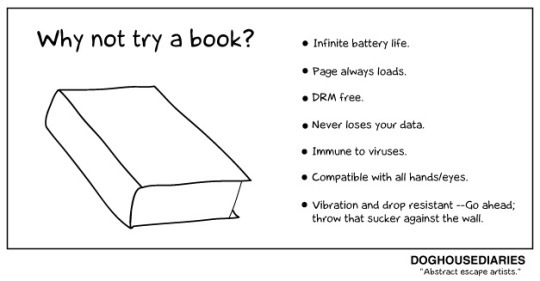 Why not try a print book? 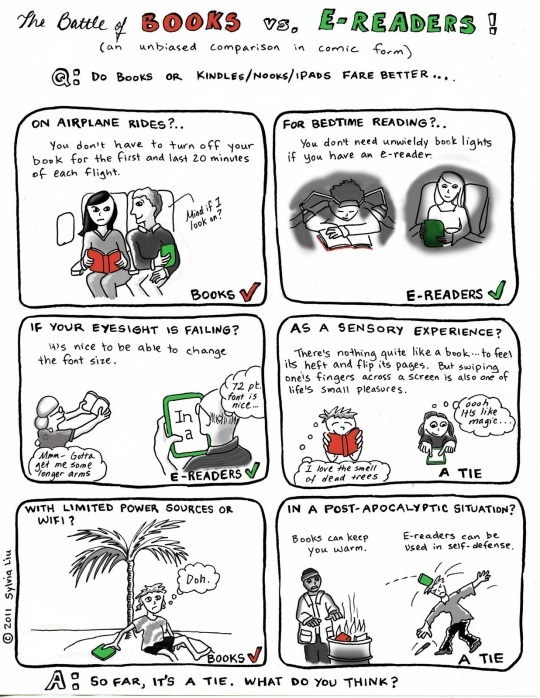 A paper book as seen through disadvantages of an ebook. A cartoon by Doghouse Diaries. ⇢ Credits and more info. 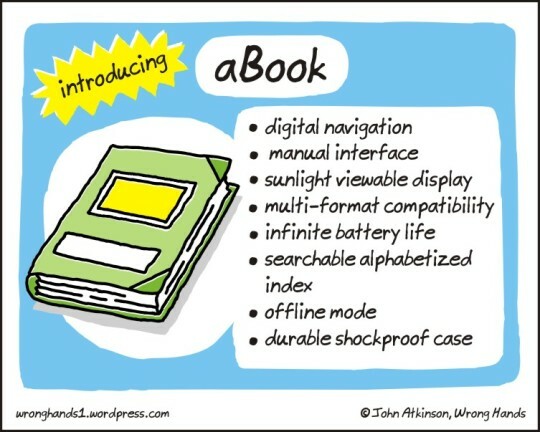 Introducing a-book. Another cartoon highlighting benefits of paper books. By John Atkinson. ⇢ Credits and more info. Nobody reads. 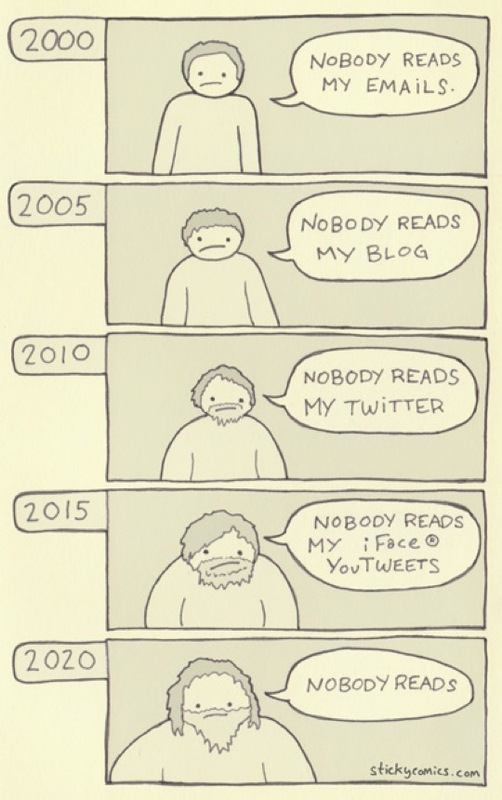 The evolution of reading, as seen by Sticky Comics. ⇢ Credits and more info. 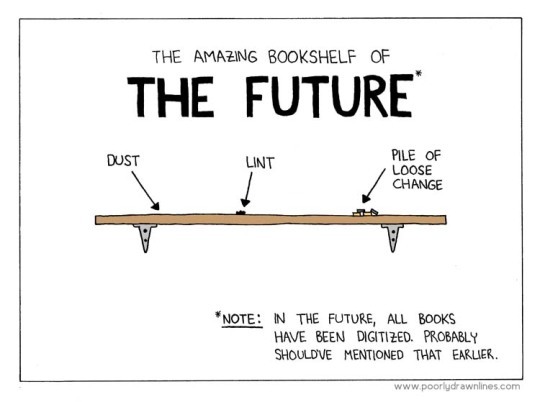 The amazing bookshelf of the future. Poorly Drawn Lines predicts the look of future bookshelves. Do you agree? ⇢ Credits and more info. 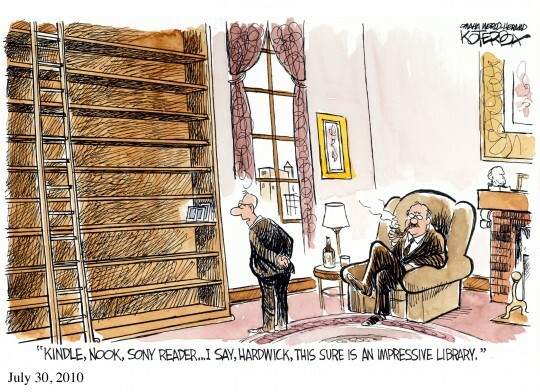 Kindle, Nook… “I say, Hardwick, this sure is an impressive library.” A cartoon by Jeffery Koterba. ⇢ Credits and more info. Ultrabook. Thin is in, by Geek and Poke. ⇢ Credits and more info. Nice e-reader. What happens when you show off your new e-reader. Another hilarious cartoon from Poorly Drawn Lines. ⇢ Credits and more info. Conversation. 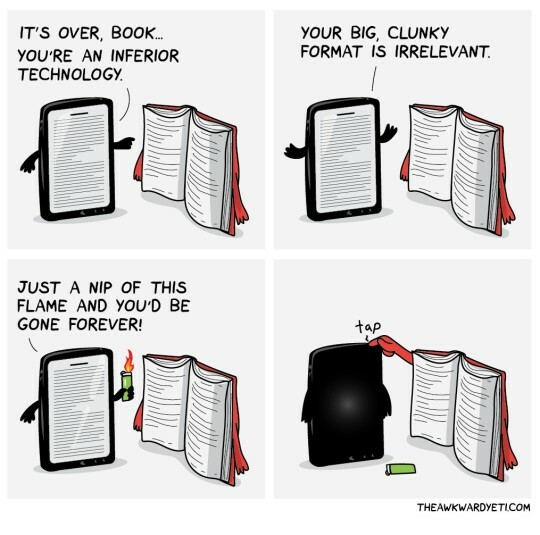 In the cartoon by The Awkward Yeti, the Kindle is definitely talking too much (and how to stop it). ⇢ Credits and more info. We are the book. A prediction from Sticky Comics. ⇢ Credits and more info. 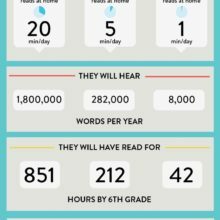 Book splits. 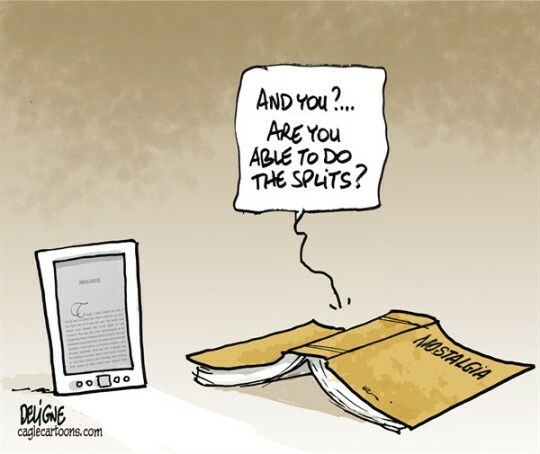 “And you?… Are you able to do the splits?” A cartoon by Frederick Deligne / The Cagle Post. ⇢ Credits and more info. Step aside!. Oh-no! I’m out of battery! Step aside rookie, I got this. A cartoon by Jack to the Future. ⇢ Credits and more info. 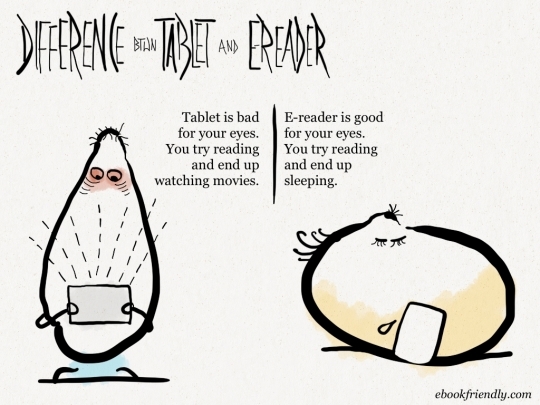 Difference between a tablet and e-reader. 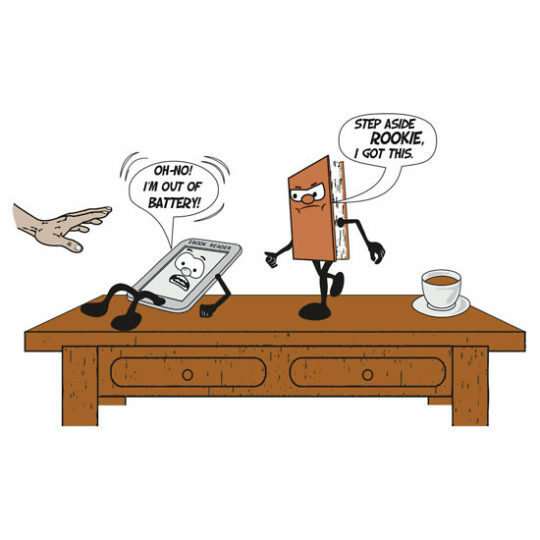 Both tablets and e-readers have their benefits and disadvantages. ⇢ Credits and more info. Literary devices. 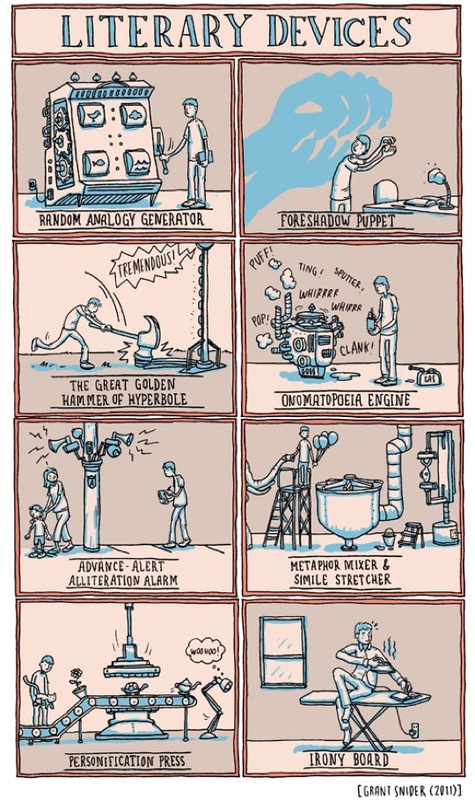 Incredible imagination of Grant Snider created a bunch of extremely creative literary devices. ⇢ Credits and more info. 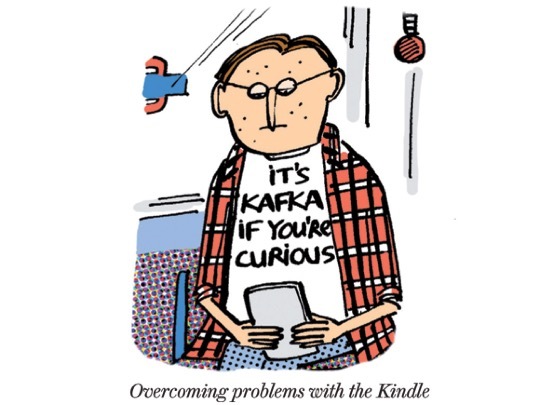 Overcoming problems with the Kindle. 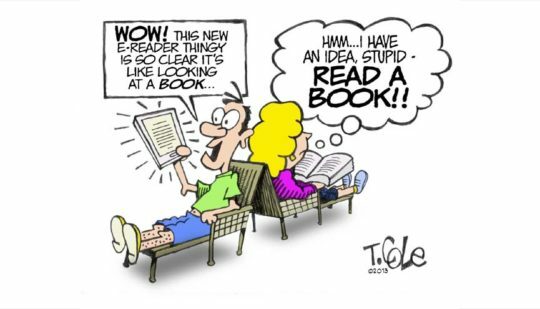 People won’t see what you are reading on your tablet or e-reader. But, hey, there is a solution! ⇢ Credits and more info. Why I haven’t switched to ebooks. 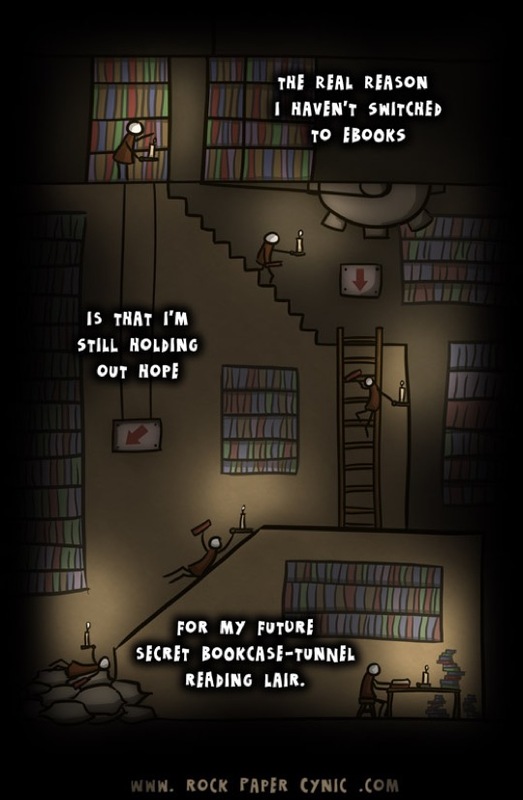 Print books are about magic, what this wonderful cartoon from Rock Paper Cynic shows. ⇢ Credits and more info. 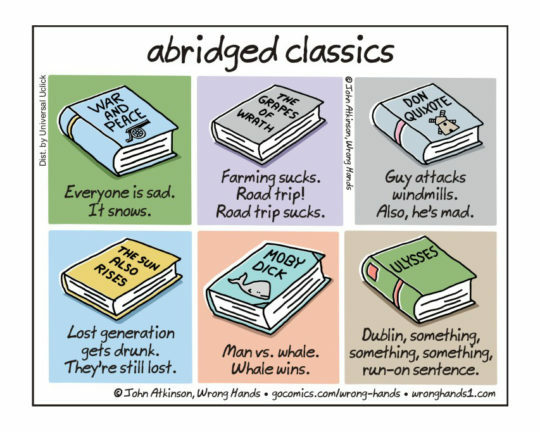 Abridged classics. Abridged versions of classic novels for people who don’t have time. A cartoon by John Atkinson. ⇢ Credits and more info. 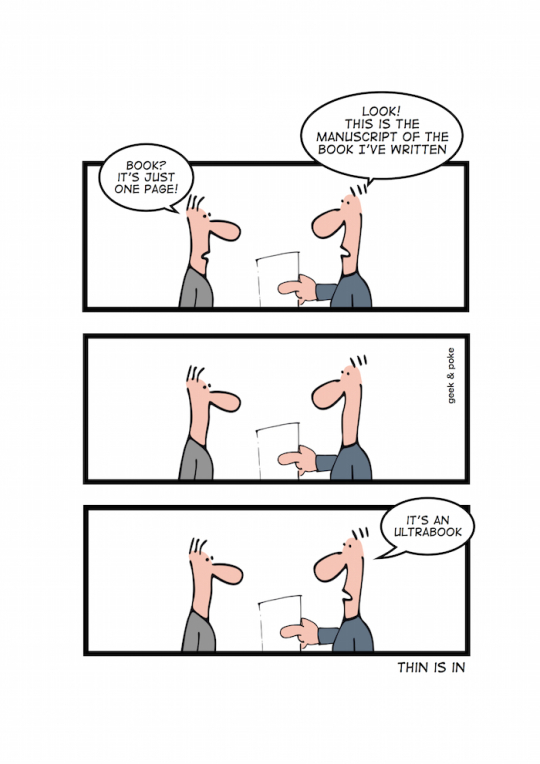 The battle of books vs e-readers. 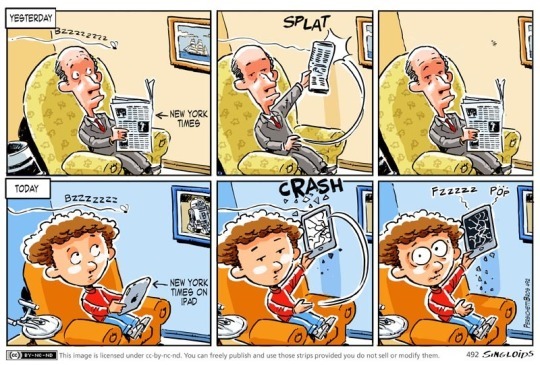 An astonishing cartoon that shows differences between print and electronic books in a funny and amusing way. Created by Sylvia Liu. ⇢ Credits and more info. 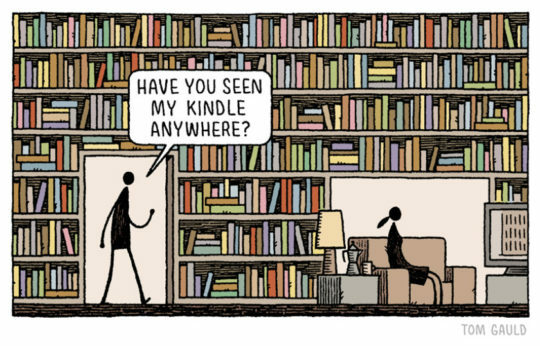 Have you seen my Kindle anywhere?. Another brilliant cartoon by Tom Gauld, originally drawn for The New York Times. ⇢ Credits and more info. 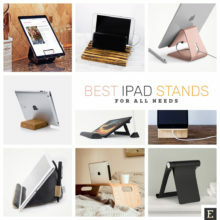 7 types of e-readers owners. 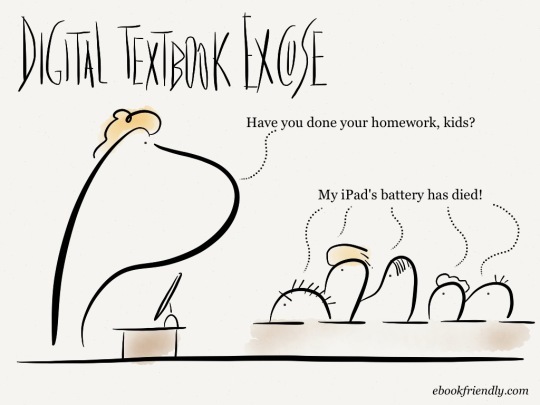 Our homemade cartoon takes a look at types of people who buy e-readers. Which type are you? ⇢ Credits and more info.